On 1st. September 1939 the squadron was placed on a 6 hour standby for a move to the Libyan border but, as in Europe, nothing alarming happened during the first months of the war and the squadron was able to carry out constant training to work up its new aircraft and crews to a high standard of efficiency. This must have been a welcome and vital alternative to being pitchforked into immediate action. During this lull, on March 5 1940 S/Ldr Keily brought back a Blenheim IV L9218, from England to Heliopolis, flying from Liston down to Marignane then Malta and landed at Helio. The serious fighting in the Middle East, which has become known as the first Libyan Campaign, started in June 1940 and 113 was in the thick of it from the beginning. 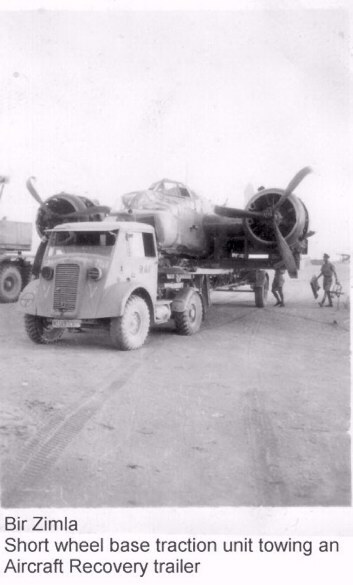 On June 10 1940, an HISTORIC DAY FOR THE SQUADRON, the first Libyan campaign starts and the squadron is moved from Heliopolis to Ma'aten Bagush and immediately prepares for operations. Corp Norman Mark (George) Lamb describes the stark contrast between the relative civilization in Alexandria and the sub human conditions in the desert: "In April we are moved into the western desert, this is certainly different, miles and miles of sand and dust, we are about 140 miles from Alexandria at Maatan Bagush, it was here that our fitters and riggers installed a large tank in the bomb bay of one of our aircraft, and we are testing it with a mixture that smells like aniseed, it is then flown over our airstrip and the contents released, the test's are successful, so we are ready, if, and when the time comes for gas warfare". "At present we are busy getting bombs, petrol etc., from the nearest station, Maatan Bagush, also enjoying a dip in the sea during the evenings. It is strange to see nothing here but camel thorn, that grows to about one foot high, no trees, no nothing except our aircraft, dispersed in the distance, and tents which are our homes for the present. Conditions were a bit rough at times as one could expect, such as the sandstorms, but top of the list for me was the flies. When you went to the mess tent to get your meal and tea you had to put your hand over the mug or else it would be full of the blighters. I expect we all swallowed a few in our time". Allmost certainly the digs of A Flight Ground personnel. The mounds in the foreground and center are their trench quarters. Note there are people just to the right of the center trench. As Corp Norman Say is obviously in his, and the other is also occupied it would indicate this photo was taken during a raid or air raid alarm. Given the dusk to the left of the picture and the over exposure on the right I would guess the picture was taken very close to sun up or sun down with sun down being the most likely given this was the favourite time for the Italians to pay a visit to the 113. Sgt B Shelton diary records; Monday June 10, 1940 "Today we arrived at Ma'aten Bagush after a journey of two days in the desert. Spent all the morning erecting tents and doing other jobs, all of which should have been carried out by an advance party, a week ago had there been any organisation whatsoever. The machines arrived in the afternoon and after filling up, picketing out and covering up, we were told that Italy was at war with Britain and France. We were then turned out after dark to inspect the aircraft and help the armourers to bomb up. We finally got to bed at midnight". Corp Norman Say LAC also comments on this first raid which must have been a stressfull and exciting time for the Squadron: ".......Italy decided that it was time to enter the war. We went up into the desert at Màaten Bàgush. When we got there the CO said we would be at war with Italy next day so we were going to get the first strike in, we should go down to the aircraft, get them fuelled and bombed up ready for a dawn take-off. Now in those days there were no refuelling bowsers, and the petrol came in four gallon flimsy cans. They had to be handed up to a fitter sitting on the wing who poured them into a big funnel, the rest of us were bashing holes in the tins and passing them up. There were nine aircraft to refuel and it took ages. (Blenheims held 400 gallons, thats 100 cans each) Then we had to help the armourers to bomb up the aircraft with the result that it was dark before we finished. We hadn’t been able to erect our tents before we started, so we finished up rolling ourselves in our blankets and sleeping out in the open. At dawn our aircraft took off. As an attack on us was expected we were told to disperse into the desert, and come back when the aircraft returned. There weren’t really any places to disperse into as it was all low thorn bushes, but there were a few rocks and we managed to shelter from the sun behind them. When the aircraft returned we went out, did our inspections, refuelled and rebombed them and again it was very late before we finished." The Squadron's entry into the war wasn't quite so physically demanding for the aircrew as evidenced by P/O Michael Shekletons comments this day: We fly from Helio to Maaten Bagush and arrive late in the afternoon to find our convoys have got in and tents are up for us. Darkness falls. A staff car is seen racing madly along the road from 202 Group Headquarters. We are shouted into the Mess Tent. Barney (S/Ldr Keily) says: "Italy has come in. Stand-by and I'll let you know the bomb load later." We expect to take off there and then but hang about until 11pm. and are then sent to bed! At dawn on the morning of the 11th of June the raid got underway with 26 Blenheim I Bombers of 45, 55, and 113 squadrons making an early morning bombing and straffing attack on the Italian airfield at El Adem, Libya. Sgt Shelton elaborates: "Several aircraft on the ground were bombed and the ground crew machine-gunned. According to those who took part in the raid, the Italians were totally unprepared for a raid. Obviously they did not expect us to attack so soon after the declaration of war". Three aircraft failed to return one of which was 113 squadron L4823. F/Lt (Basher) D Beauclair, Sgt H. Owen and LAC J Dobson survived but were captured and now have the dubious honours of being the first aircraft lost by 113 Squadron in WW2. All the other 113 sqdn aircraft returned safely except for holes caused by shrapnel. The attack was repeated later that day and 18 enemy aircraft in total were destroyed on the ground. P/O Michael Shekleton Obs., provides a detailed account of this historic first operation: Turned out at dawn. We're to raid Menistir or if there's nothing there then El Adem. From 4am. till 6.45pm.we hang around our aircraft. At last we're off. Menistir is 150 miles. We fly out to sea. I'm with (pilot) F/Lt Bob Bateson (in L8463). Barney (pilot CO S/Ldr Keily) is leading with John up. On ETA we turn in and sweep over the coast. There is Menistir but there's nothing much there except for a couple of Savoias. Barney turns west and we follow. We're down to 1000ft. calmly flying along a main road. In a great wadi are hundreds of transports. We steam past a convoy. Sixty-five miles of this and here's El Adem. Bob yells: "Lord, look at `em!" I clean forget to be scared. John drops a sitck on the hangars. We follow. A crowd of men on the tarmac (apron) is staring up at us stupidly. They turn and run as I ping off. I have no feelings at all. John's bombs (means first stick) burst beside the hangars, mine go through the roofs. On the tarmac are about 30 a/c. I'm sure I miss them and my second stick goes on the field. We're off now streaking toward the sea with fighters on our tail. And there's `Basher' (F/Lt D Beauclair) burning in front of us. Barney's shouting. "Join up! Join up!" `Basher's' going down. Two fighters are attached to us. We hear their guns but we are too fast for them. (Later identified as CR32s MHS). We're away. `Basher' has belly-landed. Written in dusk at our tent entrance on 13th. There's been the most glorious sunset! Interestingly, after the raid L8463 was found to have been holed 13 times and needed to have the wings removed and shipped back to Aboukir for repairs. Blenheim IV, with wings removed. Not likely L8463 noted above as they were then flying Blenheim 1's. Bir Zimla is a satellite of Maaten Bagush and is actually where the 113 was posted. "While fully appreciating the initiative and spirit shown by the Squadrons operating under your command in the Western Desert, I must draw your immediate attention to the urgent necessity of conserving resources, instances are still occurring when Blenheims are being used for low level machine gun attacks against defended camps and aerodromes. I consider such operations are unjustified having regard to our limited resources of which you are well aware. I feel therefore that we must consider carefully every air operation we embark on". How seriously this directive was taken will be noted by the next entry in Bernards log on June 16. "Raid this morning on El Addam (El Adem which is approx 18 miles south of Tobruk). Reports on this raid are very conflicting. Some say that the raid was a success - others a washout. "A" Flight was badly shot up, but all the machines returned safely". So much for no bombing! and conserving planes. One Blenheim destroyed and a whole flight shot up within 3 days of the order to desist. Initially, this raid was supposed to consist of 9 aircraft of 113 and 55 sqdrns but three of the 55 sqdrn aircraft did not reach the target. The ones that did, suffered heavy attack by Italian fighters as Sgt Shelton has stated. This called for a change in tactics and later this night the 113 made single surprise attacks on the hangars and aircraft at El Adem by shutting down their engines over the sea and gliding in over the enemy. It is hard to say who thought up this ridiculous idea but the fact it dosen't seem to have been repeated suggests there was a few white knuckled pilots franticly trying to start their engines as they plummeted onto the enemy aerodrome. If Longmore had have gotten wind of this prank use of his scarce Blenheims only days after his directive, heads would have rolled. My guess however, is that the story is just squadron lore but perhaps could have been tried once by one of the pilots at this time. P/O Shekleton recorded the following for June 16 and note he does mention the evening nuisance raids but makes no mention of them shutting their engines off. Bob (F/Lt Bob Bateson) leads us on a raid on Tobruk Harbour. 9 aircraft. Dropped half our load (small ones) on a satellite just south of the town (El Adem) where there were about 30 parked aircraft, some three-engined things, the rest on assorted shipping. The battleship had so flak much reduced. No one saw the sub - (supposedly sunk earlier). A string of 42s got up from somewhere and came at us but Bob led us out westward at nought feet in very tight formation and I think our combined fire-power must have been a bit daunting for the Italian pilots. Interesting how spurts of sand got up ahead of us. The 42s are armed, they say, with two heavy (half-inch) guns. The fire rate is quite slow - compared with our Brownings. `Dickie' Squires (F/O P. Squires) had some hang-ups and peeled off to try to shake them off. Three machines were put u/s. The big slugs make nasty holes. De-briefing mercifully postponed till after breakfast. Later four crews go on the Bombay to Aboukir for more aircraft. At 6.45pm we put up 4 to `nuisance' raid on Tobruk singly, Bob in the van. It must be very irritating having your dinner interrupted by machines flying in one by one, dropping 20s and 40s in penny numbers for an hour or so. We tried to hit transport and oil tanks. The flak is very pretty - looking back, but rather frightening to fly toward! I said if we had actually hit an oil tank there should have been a lovely blaze. Bob said consolingly that unless the Italians were completely balmy the tanks were most probably empty anyway. Bardia's searchlights waving about as we turn for home. I use Solum's pretty little harbour as a fix and we drive along the coast road. Bob and Tommy (Sgt Tommy Thompson WOp/Ag) squirt from time to time at the weak lights of transport until we cross the wire into our own bit. The jettison button squawks all the way home - we have hang-up but Bob makes a sublime landing. Rands (P/O ? Rands) comes out with a pick-up to collect us. Bob Bentley is missing but we hear later he has landed at Fuka. June 17th, Bob Bentley flew in just after breakfast. He brought his bombs back - had frost on the wind-screen and got lost. Photos from the morning recce showed some aircraft damaged at Guppi - the satellite. No one claimed these hits. P/O Phil Williams, with P/O Peter Wakelin navigating, did a deep recce. Derna, etc., Mersa Matruh heavily bombed today. We hear there was little damage so the Italians are no better at it, apparently, than us. But what is the target? We're told Mersa's just a little seaside place for weary Egyptian businessmen! What happens if Egypt refuses to declare war on Italy? Do we retire to Palestine? A Hurricane dropped in today and we re-fuelled it. Lovely take-off Merlin roar! (P/O Shekletons comment about Mersa Matruh being a resort for retired Egyptians is a bit of insider humour, wink, wink. Mersa Matruh was virtually swarming with British soldiers and materials. In fact it was a major, heavily fortified British stonghold and, as originally planned, was the front line of defense should the Italians cross into Egypt. It was also the terminus of the railway from Alexandria and the end of what was considered good supply road. Mersa Matruh, versus the original planned defensive role, ultimately became the springboard for the British surprise offensive which was very soon to follow. On September 18th., disaster stuck when, during what is described as a `defended raid' on Tmimi 18 Sept, 1940, the CO, S/Ldr. Keily, recorded at this time as having a DFC in addition to his earlier award, was shot down thus ending the longest period by anyone in charge of 113 squadron. S/Ldr Keily was the only survivor and became a pow. Sadly, his crew, Sgt and LAC Sgt J Jobson (who only a few weeks earlier had scored the Squadrons first Italian fighter shot down) were both killied. Following this, F/Lt Bateson who had been with the squadron since 1938, was promoted to S/Ldr and became Co of the squadron. Under the new CO, continual operations were carried out and by this time all the squadron aircraft were Mk. IV Blenheims replacing the original Mk. I's. In January 1941 the squadron, or at least part of it, is reported to have been stationed at Sidi Barrani. According to the log of Sgt Lister Walker WOp/Ag, they were also using Sidi Barrani as a refueling stop. By this time the Allied Army had reached the perimeter of Tobruk's defences and carefully prepared to attack. Immediately proceeding this softening up, and after a delay caused by sandstorms, at dawn on January 21st, the 6th Australian Division, 16, 17, and 19th brigades utilizing 12 Matilda tanks and captured Italian M13 tanks (cheerfully painted with their leaping kangaroo crest), attacked Tobruk. Simultaneously the Blenheims of 45, 55, and 113 Squadrons, in support of the troops, attacked enemy positions within Tobruk making a total of 87 sorties throughout the day. On the 22 January Tobruk fell. AC-1 Sgt Sam Bessey comments on an interesting excursion he and two others from the squadron were sent on just after the fall of Tobruk on January 22, 1941: I was detailed to fly with Padre Cox and a F/Sgt armourer to the Italian air field in Lybia just South of Tobruk where we duly got shelled on landing from the St Giorgio, the Italian battleship in the harbour. I was sent there to help the Padre bury the dead and also to help the Sgt to look for booby traps which they were very good at. 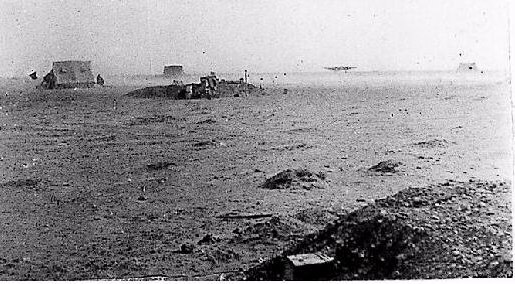 They did drop a load one night on our camp consisting of fountain pens, plates and thermos flasks, anyway being just outside Tobruk when it fell, I can say that I was the first airman to enter the town. Everyone converged on the local cinema for loot as this is where the town folk had stored all their posessions before evacuating. These thermos and pen bombs were no myth and untill a warning was spread about them, there had been several serious incidents of maiming and death within all the armed services. Tobruk now in hand, the momentum never slowed and as the Army chased the retreating Italians down the coast and across the desert, the 113 followed quickly with moves to Gambut and then Kabrit to keep pace. Sadly the squadron was not to see this campaign to conclusion as they were then plucked from the desert and were hustled off to Greece in March.